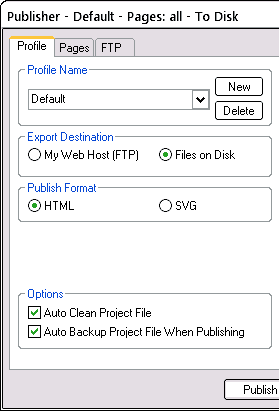 SiteSpinner includes a Publisher with an FTP (File Transfer Protocol), capability that will convert your project to HTML in a local directory (folder) on your computer. Then, if you require, it can also copy it to your web site which is a directory on your remote host computer. The Publisher includes a Gather Option to create the appropriate paths to any referenced files such as images or audio, and then to transfer them to the destination folder. Once you have entered the correct information for your first publish, SiteSpinner can save your settings. To update your site, you can publish again with a simple click of the Publish button.  if you have more than one web site or extra publishing requirements, SiteSpinner can create multiple publish profiles. A profile is a list of settings you need for a particular project. Some sites may use a different name, but most will allow you to use any one of these names. If your host recommends something, use that. SiteSpinner uses index.html as the default, so if in doubt, try that first. Select the Profile tab. Click the New button and give your profile a unique descriptive Profile Name. You can have up to 99 profiles. The rest of these instructions apply to either the default profile, or your chosen profile. My Web Host (FTP): select if you want SiteSpinner to upload all the relevant files to your host. It will first create the files in your local publish directory -- on your computer disk. In the Options section, leave both checkboxes checked. Auto Clean deletes remnants of old objects that are no longer used. If you want to keep remnants for later use, uncheck this box. Ordinary folk don't need to keep them, so we suggest leave the box checked. An equivalent of this option is Edit > Clean Components. Your .ims project file is an important file -- if you lose that, you lose your project. For this reason, SiteSpinner tries to protect you from disasters by copying your project file with every publish. For larger projects, this file can exceed 1 MB in size, so you may not want to spend the time it takes to upload. In this case, turn auto backup off -- but make sure you back up your project some other way. See the Backups tutorial. Any changes you make to the Profile tab or the other tabs will be saved against your profile (or the default profile if you have specified no profile). In future, before publishing, set the profile you want from the drop-down Profile list box. You can edit your profile too -- if you are not publishing immediately, click "Apply" to apply your changes to the current profile. The Page File Names and Extensions drop-down boxes boxes display the file names of each page with the extension that SiteSpinner will create. You can enter a new name for each page and select a different extension if you wish. Renaming pages here has the same effect as renaming them in the Page Editor. Normally, you won't change anything in this section. In the Page Range section, select the pages you want to publish. Once you have selected a range, confirm that you have all the pages you expect by clicking the drop-down list box for Page File Names. In the Page Range list box there is also an option to publish only the current page -- this makes it convenient to update just one page of your site. 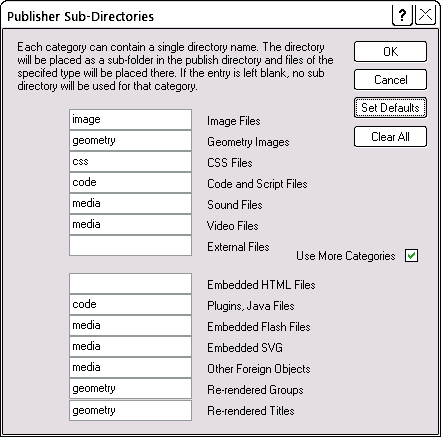 Use the Local Publish Directory to select a local directory (folder) for the published project. SiteSpinner will always place the published files in this directory. If you are using SiteSpinner to upload to your host, it will FTP to your host from this directory. Gather collects all the files for your project such as images, audio and scripts, then copies them into the publish directory. If you require, it will then FTP them to your host. This is the safest option with the least risk of missing files. Since the published code keeps file paths all relative to current directory, you can move the whole published project to another location, and it will still work. See also: Relative URLs. As you gain experience, the Relative option is also reasonable. For more information, click the Help button in the Publisher window. For this option, you do the gather manually, but it gives you more control. Clicking the Sub Folders button in the Pages tab and then checking the Use More Categories checkbox will produce a window like that below. This window shows the common file types and the default folders where SiteSpinner will place them. Normally these will be just fine, but once in a while, you'll want something different. If so, change them here. If you have a blank sub-folder, files of that type will go in the root folder of your site. If you had any Publish Files included as Embedded Objects, they are "External Files" here. If you leave the default setting blank, publish files will go to the root -- the top level folder of your site. See also the Embed File or Media tutorial: Format Type vs Publish Folder. We'll continue by assuming that you are publishing the Hello World project (2 pages) and that you have set up a profile called HelloWorld. 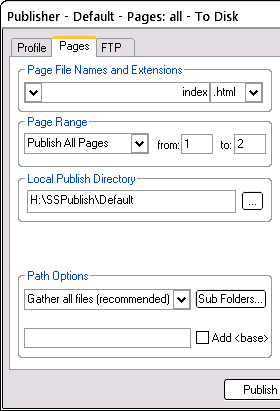 Put a forward slash in the Remote Publish Directory for now, or let SiteSpinner do so. Click OK to accept the settings and close the FTP Server Directory dialog. 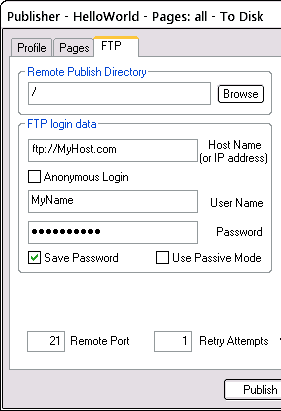 This will automatically transfer the path from the Destination Directory to the FTP Tab Remote Publish Directory. If you know the path, you can enter it directly into the Remote Publish Directory edit box, but keep in mind that some hosts are CaSe sensitive. 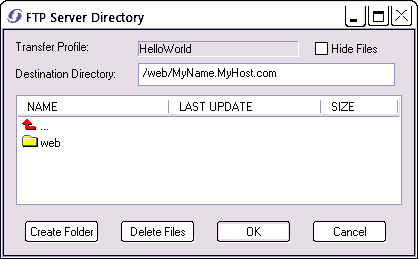 To avoid typos, it is best to browse for the directory as we have done, and allow SiteSpinner to make the setting. In turn, this setting will form part of the profile for this project, after you click "Apply", or "Publish" using the profile. You should now be ready to export your project by pressing the Publish button. The name of each file that is being FTP'd will be displayed in an Export Progress dialog. Any errors indicates that for some reason, such as a lost connection, a read protected file or a write protected remote directory, the file was not transferred. If there were errors, check the Export Progress log to see exactly what they were. With that information, you will be better placed to solve the problem. You can right-click the body of the Export Progress log, use "Select All" from the context menu to select all the text -- then use the standard Windows Copy/Paste keyboard shortcuts to paste it elsewhere for easier study. The most common reason for failure is that you have a firewall (or a program like "Net Nanny") turned on that is blocking the transfer. In that case, you must set the firewall to allow SiteSpinner to access the Internet. 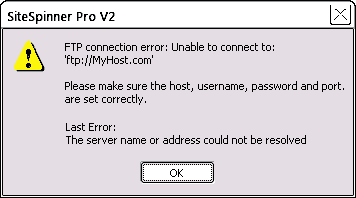 Try to log on to your site via the Windows FTP or some other FTP program. If you can, it is at least confirmation of your login details. You may instead choose the "other way" to upload, and instead use SiteSpinner only for the publish to disk. On the Pages tab, double check the pages you are asking to publish. If you are actually publishing only a single page when you mean to publish "All", you may think your publish is doing nothing. Check your Export log to see what html files SiteSpinner is actually publishing. You may be trying to publish to the wrong part (folder) of your site. If you do not know the correct part, try leaving the Remote Publish Directory as a forward slash, / Then allow SiteSpinner to set the directory by browsing your site. Look closely at all the error messages in your Export log. Even though they seem cryptic, there may be some clues there. Are there any patterns in the files that are producing the errors? Look at the locations where the files are going -- if wrong, you need to correctly set your Remote Publish Directory by browsing your site. Put auto backup off -- sometimes hosts will not accept . ims project files. If the ims project file is the only one showing errors in your Export log, this is the probable reason.